Let's Focus on Procedures, Projects, and Preparation! And, don't forget about YOU! Hang onto your hats and get ready to take notes! As a former classroom teacher, I have started my year badly by teaching all my rules and procedures on the first day. I cannot imagine how excruciating it was to have to sit and listen to a teacher talk about all the procedures for hours. Did the kids remember it? NO! I learned the hard way yo teach a few procedures every day and spend the first two weeks practicing all the routines we would follow. Now, as a specialist, I know this is still important. We practice everything- from how to come into the room, where to sit, how to clean up, and how to use materials. Place a dishpan with wet washcloths in a central location. When teams have their tables cleared off a student can grab a washcloth and scrub down the tabletop. Use real washcloths! They work better than paper towels. Links at the end of this post will take you to blog posts about each topic! I hope you already know my fun way to teach STEM Lab rules. First, my kids have a fun scavenger hunt to find items in the room- which just happens to include my Rules Bulletin Board. Kids LOVE Scavenger Hunts! So, what happens when they finish the hunt? It's time for STEM after the scavenger hunt! This little challenge has turned out to be one of our favorites. Each team chooses a rule to model. Then they choose their materials based on what their building plan might be. Can you say engaging? The best part, however, is sharing all these models. Each team shares and teaches the rule to everyone in the class! So much fun! And, this challenge is free in my TpT store! 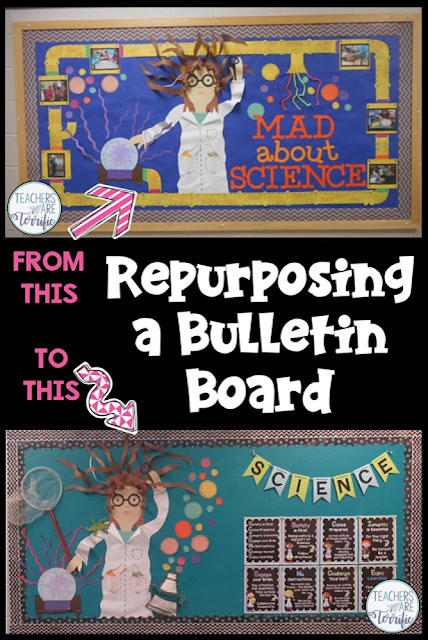 Do you love bulletin boards! I do! This year I painted the background of my bulletin boards black. I really love the way posters and brightly colored paper "pop" off the black background. If you cannot paint your boards, try using a fabric background. I like the painted version or fabric because you can staple items to the board and reuse the background endlessly (no staple holes). Here's another tip about bulletin boards! If you ever create one you absolutely love, take it down carefully and re-use it another year. Change it around a little bit or recreate it exactly the same. The boards in the photo were so fun to make! The first one (the top photo) took a long time to create. I loved it so when I took it down I carefully saved all the pieces. The following school year I recreated the board using the scientist parts and some new posters. 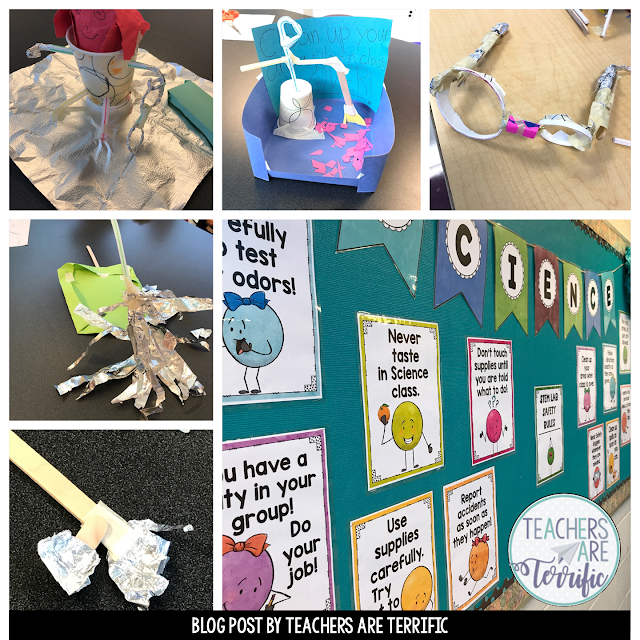 I have several Bulletin Board blog posts! Links at the end! 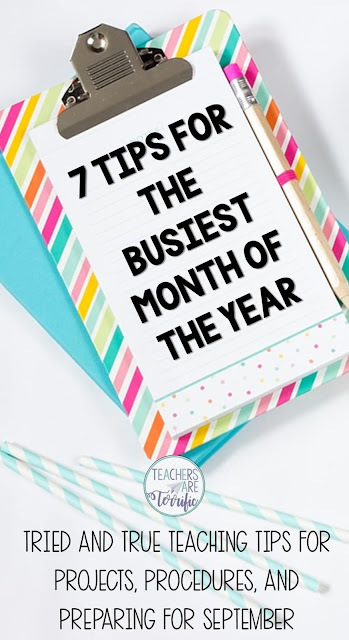 Okay, you are finally ready to get started with some big projects in your classroom. Routines are going well, procedures are being followed, kids are doing their work.... well, let's hope all of that is true! So, it's time for some STEM! Start with some simple towers. These towers use easy materials that you might already have and there is very little prep. This will help your students learn about the Engineering Design Process and it's the perfect opportunity to bring even more teamwork into your classroom. So, one year I found myself with so many boxes of brand new pencils. Well, that sounds heavenly, right? Nope. They were all unsharpened. I totally dreaded having to sharpen pencils to get started and then I noticed something. Those round pencils reminded me of dowel sticks which reminded me of building things- which led to STEM Challenges that use pencils as the main building supply! We really enjoyed these challenges using pencils! It includes towers that have a twirling part, pencil boxes, and drawbridge models. In a STEM Classroom, we have to be very frugal with our materials and we reuse as much as possible. I save everything and try to find unusual and inexpensive materials. With multiple classes, I have to do this. Using the brand new pencils was a perfect idea! After we took structures apart, the pencils were sharpened and ready to be used- as pencils! I don't know about your classes, but my students come to me with very little knowledge of experimenting or using the Scientific Method. When I discovered this a few years ago, I decided to create some fun experiment events that kids would really enjoy and throw the Scientific Method right into the middle of it! This resource proved to be amazing for the students. They experiment with different liquids to see which will create the fastest dissolving of the effervescing tablet. Then they design their own experiment after creating a hypothesis. Highly engaging and so fun! My last tip is all about you! These first two months of school are overwhelming and stressful! How do we make it every year? This post (above) is not about school! It's about things you can do at home to make your school year begin with some organization and tips to make it a little easier! If you are a specialist, don't forget how important it is to teach procedures and practice them. Try an engaging STEM Challenge to teach your classroom rules! This hands-on method is a sure-fire way to have kids remember your rules! Paint your bulletin board backgrounds! Or cover them with fabric. It will save time in later years. Save your favorite bulletin board pieces and arrange them in a different way for another school year. Try a STEM Challenge that uses easy materials to work on collaboration and teamwork. Use materials frugally and even try some unusual materials for STEM - like pencils! Use an amazing experiment to teach the Scientific Method!